Blowout Sale! Free Shipping Included! 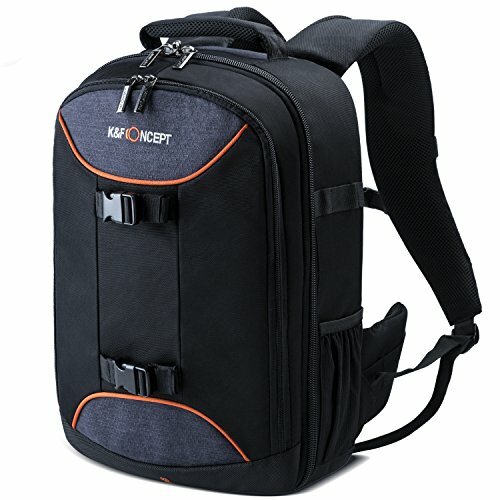 Save 57% on the K&F Concept Professional Camera Bag 20L Large Capacity Backpack for DSLR Camera, 13.3'' Laptop, Lens, Tripod and Accessories with Rain Cover by K&F Concept at Video Camera Authority. MPN: USKF13.051. Hurry! Limited time offer. Offer valid only while supplies last. 【Capacity Upgrade】L x W x H: 11.81*6.3*16.54" (Bag's capacity is about 20L); Holds 2 Cameras + 5-6 Lenses + Accessories; Dedicated pockets for carrying laptop up to 13.3 ''. 【Quality Material】Splash-proof and tear-resistant high-density nylon, sturdy and durable; Unique stitching and retention technology ensures the weight bearing areas won't be frayed or ripped; PE board + EPE foam divider,strong and solid, shock relief and decompression. 【Easy Travel】Breathable air-mesh straps and ergonomic well-padded back keep you cool and comfortable; Adjustable chest belt keeps the straps tight on you shoulders,reduce weight; Tripod straps to hold lightweight tripod with bottom pocket for dual protection. 【Exquisite Design】Antitheft zippers for main compartment, bidirectional customized zipper puller, high-quality buckles; Webbings on both sides are designed for climbing buckle hanging gadgets. 【Applicability】Compatible with Nikon D500 D5500 D3200 D7200 D7100 D5100 D3100 D5300 D5200 D5300 D3400 D3300 COOLPIX P900 P610 P600 P530 P520 P510 L840 L830 L820 L810 L330 L310, DL24-500 Digital Camera, Canon EOS T6, T6i, T6s, T5, T5i, T4i, SL1, 80D, 70D and more DSLR.